The current boundaries of the Fort McDowell reservation mark only a small portion of the ancestral territory of the bands of Yavapais whos homeland was the vast area called Arizona and the Mogollon Rim country. These people hunted wild animals and gathered food. It is likely they refreshed themselves at Montezuma Well as history indicates that the Yavapai’s early origin is Ahagaskiaywa (Montezuma Well). December 28, 1872, the “Skeleton Cave Massacre” killed 100 Yavapai men, women and children during a surprise attack. Yavapai consider this the most horrible massacre in their history, and newspapers and Army reports of the day describe it as one of the most “terrible battles in Apache history.” Reports indicated 75 “hostiles” were killed and 25 captured. At an elevation of 1,350 feet, the peaceful topography of this reservation belies its bloody history. The serene landscape ranges from tree-lined bottom lands to cactus studded rolling hills. 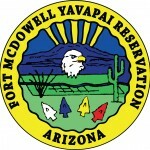 The reservation was designated in 1903 when the kwevikopaya, or Southeastern Yavapai, who lived in the Matazal-Four Peak and Superstition Mountain region, were granted 24,680 acres of the old Fort McDowell Military Reserve. This has been one of the most important outposts in the southwest during the Apache Wars which occurred between 1865-1891. Located in Maricopa County, the Fort McDowell Reservation lies approximately 23 miles northeast of Phoenix. The Community’s economy is closely tied to the surrounding communities of Rio Verde, Fountain Hills, Mesa, Scottsdale and Phoenix. Large employers include the Fort McDowell Gaming Center, the tribal farm, and a sand and gravel operation, and a tribally-owned gas station. Fort McDowell is also the birthplace of one of the first known advocates of human rights, Dr. Carlos Montezuma (Wassaja). As a child, Wassaja was stolen by Pima Indians and sold to an Italian photographer who educated him in Chicago in the field of medicine. Later in life Wassaja fought for Native American rights, for United States citizenship, and other governmental policies supporting American Indian rights. He also become a leading force to help the Yavapai regain their homeland and died, from tuberculosis, while on the reservation in a traditional wickiup after he waged his last human rights war. The primary attraction is the outdoors — the swift-moving Verde River and stands of cottonwood trees. The Verde spans the length of the reservation and offers opportunities for floating the river, fishing it and picnicking on the river banks. The reservation also enjoys excellent hunting. The Fort McDowell Indian Community opened the first bingo hall in Arizona in 1983. Since that opening the gaming facility has expanded twice and now offers full service food and beverage in addition to games. The casino features 475 slot machines, a 1,600 seat Bingo hall, keno and 40 poker tables.